Alongside your flights to LA and your list of must-see destinations like Hollywood, Disneyland and the Griffith Observatory, you’ll also need to think about where you’re going to stay during your trip to Los Angeles. There’s now a huge range of choice including hotels, resorts, peer-to-peer rentals, bed and breakfasts and youth hostels. Below, we take a closer look at the most famous hotels Los Angeles has to offer, from iconic celebrity hangouts to more contemporary stays. 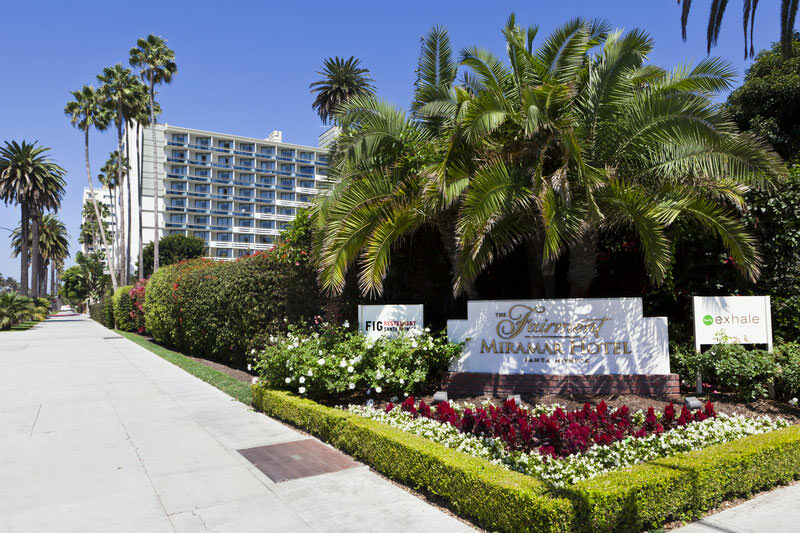 An oceanfront hotel with exquisite views of the Pacific Ocean, the Fairmont Miramar Hotel & Bungalows (to give the location its full title) is a five-star hotel located in Santa Monica. The resort first became popular in the 1920s and 30s, coinciding with the start of the Golden Age of Hollywood. The natural beauty of the hotel, with its palm trees and outdoor pools contrasts with the urban sprawl and traffic that covers certain parts of Los Angeles. Amenities include a spa, yoga studio, fitness centre and even treatments for pets! It’s certainly at the luxurious end of the market and its proximity to the attractions of Santa Monica provide quite the draw for those interested in a stylish stay. Another Santa Monica favourite, with ocean views, the Hotel Shangri-La has stood in Los Angeles since 1939 and following a refurbishment project in 2008, is now one of LA’s most stylish and comfortable hotels. Inspired by an Art Deco style that echoes the architecture of the original design, this boutique hotel offers a cosy experience with enough amenities to give that luxury LA feel. Their rooftop bar is one of the best in Los Angeles and offers cocktails, clear views of the ocean during the day and of the vibrant Santa Monica nightlife after sunset. It is also the only indoor-outdoor rooftop bar in Santa Monica, with a disco dance floor accompanying the ‘Pacific Perch’ lookout area. 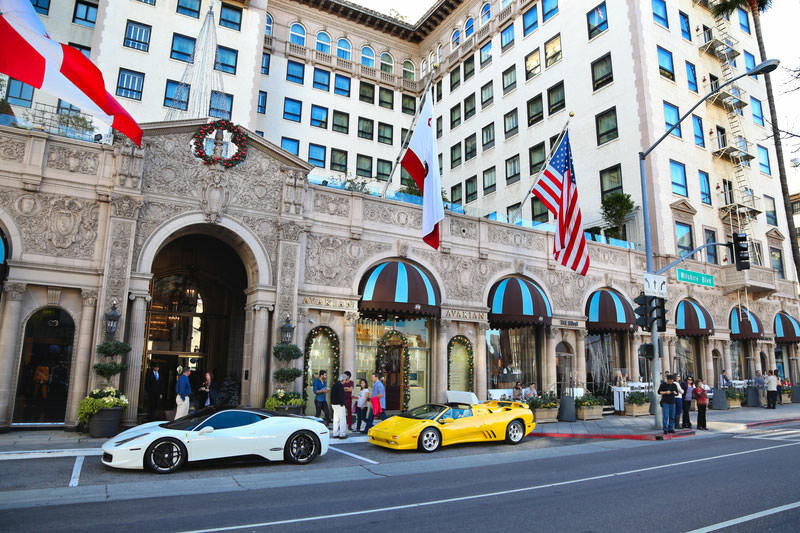 An iconic Beverly Hills location, the Beverly Wilshire offers luxury with a relaxed vibe, with nearby Rodeo Drive supplying a wealth of shopping opportunities. Although the hotel, built in 1928, has been renovated and changed hands several times (it is currently part of The Four Seasons brand) it has always maintained a distinct sense of Hollywood luxury. As well as being a starring location in the hit 1990 film Pretty Woman, it has also hosted the likes of Elvis Presley, John Lennon, Elton John and the 44th President of the United States Barack Obama. The hotel currently offers a two-story fitness centre and complementary spa facilities for guests. It is also home to CUT, a trendy and critically acclaimed steakhouse that is part of celebrity chef Wolfgang Puck’s chain of restaurants. The Standard Hotel in Los Angeles is, well, anything but a standard hotel. Based in the heart of Downtown Los Angeles, the building was once the headquarters of enormous independent oil producing company ‘Superior Oil’. Its proximity to the financial district and local metro makes it easy to visit all the key tourist spots in the city. It has a wealth of food and entertainment, including The Rooftop – an aptly named rooftop bar with heated swimming pool, beer garden and DJ booth. Curiously the hotel also features a swish Ping Pong club called ‘SPiN Standard’, with eleven professional-grade table tennis tables, surrounded by bars. More relaxing spots can be found in its Hermanos Coffee shop or The Firepit – which offers small plates and cocktails.